​Mexican Libertad bullion coins are at the top of many coin collectors' and investors' wish lists, and not just because these pieces are affordable additions to silver and gold portfolios, but also because they offer beautiful designs. Mexico's Libertad coin series began in 1981 as a 1-ounce 0.999 fine gold coin. In 1982, Mexico began issuing 1-ounce silver Libertad coins. In 1989, Mexico would offer a 1/4-ounce platinum bullion coin and in later years began selling multiple fractional gold and silver bullion coins. The word "Libertad," in the context of the Libertad coin design, is a reference to a Mexican Revolutionary slogan, "Tierra y Libertad," or, as it means in Spanish, "Land and Liberty." The designs on the Libertad coins themselves are resonate this patriotic theme. The obverses of the Libertad coins depict a winged Victoria, which is an ancient Roman goddess of victory. The obverse, showing the Winged Victoria on a Mexican Independence Victory Column, also includes the mountainous Popocatepetl and Iztaccihuatl volcanoes. The Libertad coin reverses depict Mexico's coat of arms, which includes a Mexican gold eagle eating a snake while perched atop a prickly pear cactus. The Mexican Coat of Arms is seen in various forms on many Mexican coins, both circulating and non-circulating. While Mexican Libertad coins have been around since the early 1980s, they have become increasingly popular in recent years as United States investors and those from other parts of the world embrace the multiple bullion coin programs on the international stage. 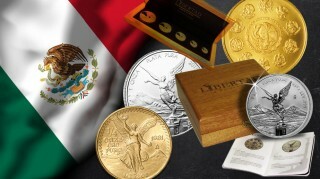 While many collectors and investors traditionally looked to the American Eagle bullion coins, Canadian Maple coins, and South African Krugerrand coins as investment vehicles, the continued prominence of Mexican Libertads is giving buyers, both seasoned and new to the market, exciting options for spending their portfolio-building dollars. Numismatists, meanwhile, have looked to the Libertad coins as yet another objective for building date sets. Silver Mexican Libertads are especially with date-set coin collectors, as these coins cost only a small premium over spot. Coin collectors can also choose between uncirculated and proof specimens of Mexican Libertads. Commonly, bullion investors will buy the uncirculated specimens, as these carry the lower premium over intrinsic spot prices. Meanwhile, coin hobbyists tend to choose the proof coins for their collections, as these pieces boast mirror-like fields, frosted devices, and offer a beautiful presentation-quality look that regular uncirculated coins don't ordinarily provide. Those interested in buying silver, gold, or platinum Mexican Libertad coins should seek their nearest bricks-and-mortar coin dealer or peruse the internet and check out the multitude of online dealers offering Libertads and other world coins. Whether collecting Libertads for fun or investing in them for potential profit, these gorgeous Mexican coins make tremendous additions to any portfolio or collection.